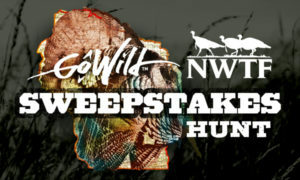 GoWild has partnered with the National Wild Turkey Federation (NWTF) to promote hunter recruitment with a sweepstakes valued at over $4,500. One winner will receive an all-expense-paid turkey hunting trip for two to Wisconsin, where they will enjoy the full experience of chasing that morning thunder! The great team from Wolf Pack Adventures will guide the adventure. By taking the NWTF & GoWild 2019 pledge, community members are committing to take someone hunting or fishing who has never gone before. The sweepstakes is open to any NWTF member — new or old. Sign up for a chance to win the Turkey Hunting Sweepstakes on the GoWild app (available on iTunes or Google Play). Entry is easy and free for members. Newcomers are encouraged to sign up and take the pledge with a friend. All-expense-paid trip to Wisconsin for two (2) to hunt turkeys with the Wolf Pack Adventures guides on May 18-19, 2019. Guide fees, hunting licenses, and ammunition provided. Take advantage of Wisconsin’s great Walleye fishing when you arrive! Fishing licenses will also be included. *Terms and Conditions may apply. See complete details on GoWild. One of the more storied organizations in conservation and hunting has partnered with the outdoors industry’s fasting growing tech startup. As the National Wild Turkey Federation expands upon its efforts to recruit, retain and reactivate hunters, it’s adding high-tech firepower to its communication plan — a partnership with GoWild. The NWTF’s partnership with the hunting app and activity tracking platform allows the organization to modernize its messaging and better appeal to a budding generation of young and first-generation or adult-onset hunters. Learn more about the NWTF and GoWild.